Description: CR SD40-2 6366(1977-built) and SD45 6109 lead a 6-unit consist out of Altoona in March, 1979. Description: Southbound on "F" track at Baltimore, CR 6469 and 6366 wait for track space through the B&P tunnel under the snow covered dormers of the row houses on St. Paul Street. Best guess date. Description: CGAL-7 departs Gang Mills yard for Allentown in the late afternoon. My test car CR 80093 is second head out.. Description: Burlington Northern Railroad SD40-2 7170 at Cicero, Illinois on October 15, 1986, Kodachrome by Chuck Zeiler. Description: Conrail SD40-2 6366 at BN's yard in Cicero, Illinois on October 15, 1986, Kodachrome by Chuck Zeiler. Description: An eastbound manifest passes ex-South Shore cars under development into a shopping center. Description: OIBU rolls through Great Bend, showing a church and Gulf station as it approaches the PA 171 overpass. Description: OIBU stops at QD as it works the yard. The leader, a straight SD 40, is now a classic, as are the buildings. Description: Sounds like a rock concert...actually, its a freight at a location on the Susquehanna River between Susquehanna and Great Bend PA, and if the light was right and you didnt have too many trees, it was a pretty nice view, as we see here with OIBU running along the river behind a pair of SDs. It would have looked nicer with a pair of EL SD45s, but cant have everything!! 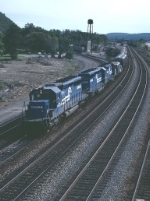 Description: Conrail symbolled the moves to the Ithaca Branch with a variety of numbers, depending on what job had the task of running the trains to the NYSEG plant in Ludlowville. Typically, it would be a Corning based crew, but sometimes it was called WAIT 2. Today, its WACG02 bringing the train off the Lehigh Secondary and through the crossovers onto the Tier. 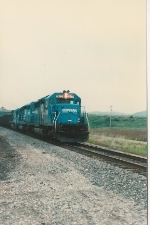 Description: Conrail helper set shoving an eastbound train through Wegley Crossing in the summer of 1990.